Pumpkin Pie…but in bar form. You’ll love how easy and delicious these dairy free pumpkin pie bars are! Once Thanksgiving is over, most people think pumpkin is also over. Not for me. I love pumpkin all Fall and Winter! 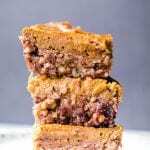 These pumpkin pie bars have a bit of a healthier “crust” made from walnuts and dates which makes this a more nutrient rich dessert. These healthy and dairy-free pumpkin pie bars take about 15 minutes of prep and 30 minutes in the oven so you don’t need a whole afternoon to make these like you would with a pie. Don’t get me wrong, I love making homemade pumpkin pie – but these bars are just so fun! I also made a pumpkin pie parfait recently which is another great dessert to bring around this holiday season! Step 1: soak your dates. Why? If your dates are a little rough, it helps if you soak them in water for 5-10 minutes before putting in the food processor. Step 2: Once dates have softened place them in the food processor along with all of the other crust ingredients. This mixture will be thick, it’s supposed to be! Step 3: You’ll want to bake the crust for about 7-8 minutes. While the crust bakes you can make the pumpkin pie layer by whisking all of the ingredients together and then folding in the flour. Step 4: The pumpkin pie mixture goes on top of the crust. Make sure you spread it out in an even layer. Place bake in oven for 30-35 minutes or until the center is cooked through. I love to enjoy these with a glaze or whipped cream on top, or you can enjoy as is! Walnuts are a great source of omega-3 fatty acids, protein and fiber. Most Americans are not getting enough fiber in their day to day diets so including walnuts is one way to get more fiber. Walnuts contain magnesium and phosphorus which are 2 important minerals involved in how our bodies function! Unsaturated fats found in walnuts are great for our heart health. You can read more about why fat is good for you here. Can I use something in place of the dates for the crust? I have never made the crust without using dates. Since this pumpkin pie bar recipe uses 15 dates for the crust it makes up a majority of it. Try out the dates, you’ll be surprised to see how much you enjoy their natural sweetness! You see, I really like the date and pumpkin combination. 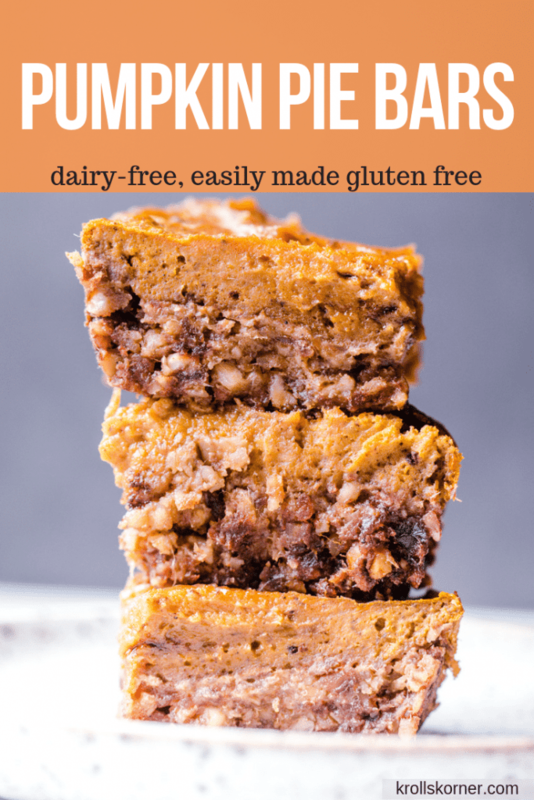 These easy and delicious pumpkin pie bars are dairy-free and SO good! 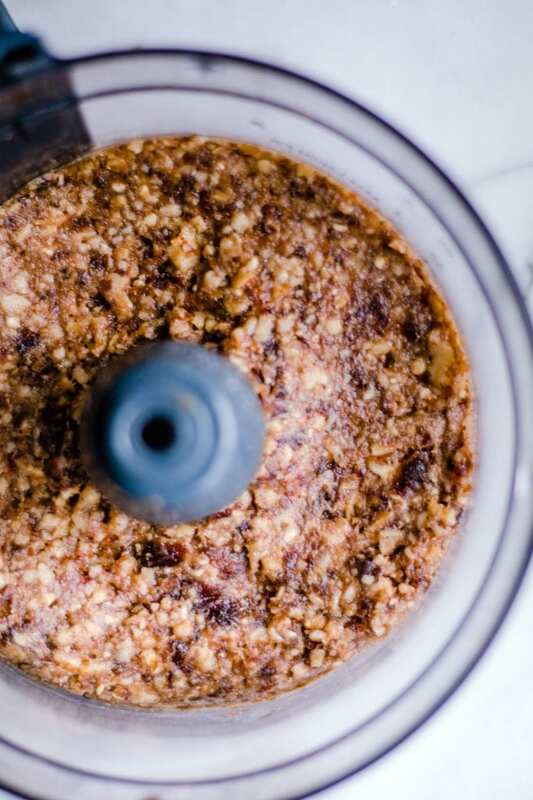 All you need is your food processor, 45 minutes and you're on your way to pumpkin pie bar heaven. Preheat oven to 350 degrees F. Make the crust: place soaked dates (water discarded) in the food processor with remaining ingredients. Mix well. The mixture will be thick. Line an 8x8 baking dish with parchment paper or you can spray with PAM. 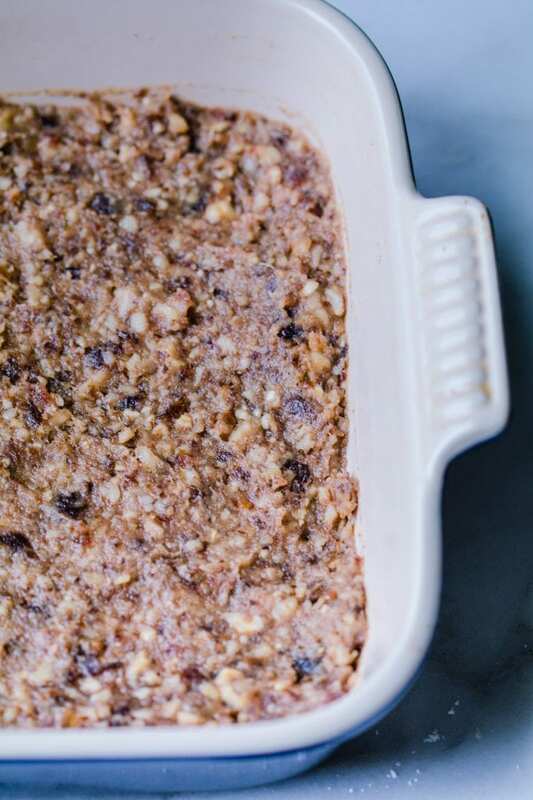 Place the mixture in an 8x8 baking dish and press the mixture into an even layer. Bake the crust for 7 minutes. While crust bakes, make pumpkin later. Whisk all ingredients (except flour) together in a medium bowl. Then fold in the flour. Pour this on top of the crust and bake for another 30 minutes, or until the middle is completely cooked. Let sit for 10 minutes before cutting in. Enjoy with whipped cream on top or a simple glaze made from powdered sugar! PIN these dairy-free pumpkin pie bars for later! Thank you Susie! so easy and healthy! My youngest is dairy free, these would be a yummy treat for him!! I’m with you though- pumpkin allllll winter long! I love that you’ve used dates instead of cane sugar in the crumb layer. I love dates and I cannot wait to try this! The natural sweetness is so good!! Thank you! Love that these are naturally dairy-free! I am obsessed with pumpkin so these will be the perfect treat for the holidays! I love the addition of coconut in the crust! Thank you so much! Pumpkin never gets old! Could literally eat the crust on its own. Sorry not sorry! I may or may not have been doing the same thing!! Thank you! These were so easy to make and I couldn’t love them more!! Thank you so much, I am glad you loved em! I love pumpkin pie so much, now I have a portable version. So yummy, thanks!